This post is written by Mindy Justis, marketing manager for Experience Columbus. You can follow her on Twitter @MindyJustis. If you’ve had the chance to #catchtheCBUS you know it hit the streets of downtown Columbus with added free (yes gratis) connections to lots of shopping, dining and entertainment options from German Village to Victorian Village. The schedule runs every 10-15 minutes depending on the day and time you’re traveling. Operated by the Central Ohio Transit Authority (COTA), special CBus signs are posted along the way to distinguish it from other fee-based bus routes. When you see the buses painted with a big star, you’ll be interested to know they’re running on compressed natural gas. It’s a greener option than gasoline because of the lower impact on the natural environment than fossil fuels. And the seats have their own story too. Columbus residents had the chance to cast their vote and riders chose fiberglass seats to adorn the new fleet. 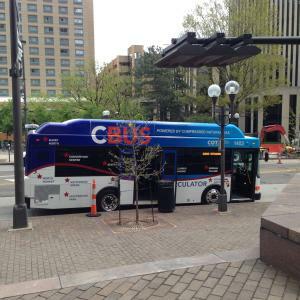 Next time you’re trekking downtown, be sure to catch the CBUS.